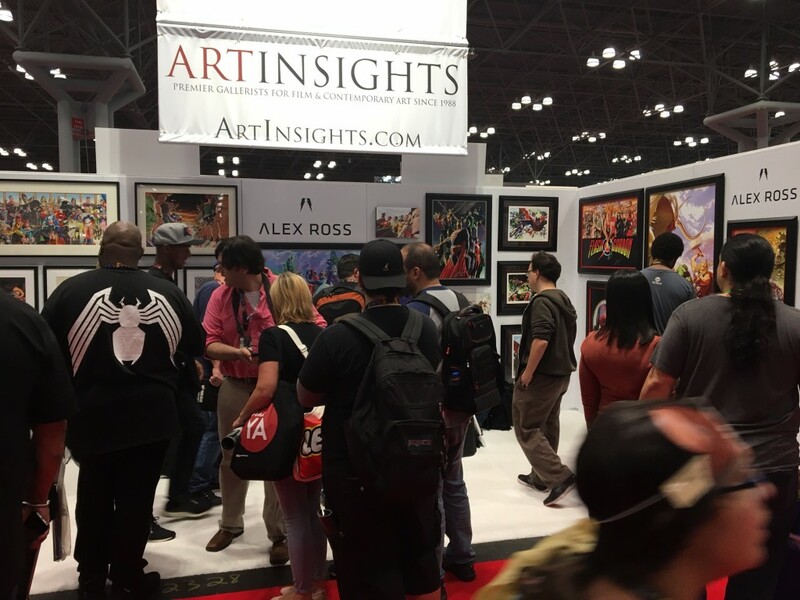 We and the folks at Alex Ross Art brought and shipped lots and lots of art, including, for the first time, original paintings and drawings offered by anyone outside Alex’s agents. For us this was a big deal! We had some gorgeous Spider-Man art, and some truly lovely drawings we were very excited about. We also had the exclusive signed lithographs that featured three great images of Cap, Batman, and Doctor Strange. What took the longest on Wednesday was Michael (MB) methodically putting security hangers on the valuable art, and the art being displayed on the outside walls of our booth. Those pieces were brilliantly placed, because you could see them from across the hall. One side had all Beatles, and the other side had four pieces from the Shadows collection, which has a gorgeous Wonder Woman. The security hangers worked. Halfway through the con someone tried to steal her, which I could tell by the certain way the wall was shaking. I calmly peeked around and saw a guy trying to wrestle her off the wall. Wonder Woman was having none of it. HURRAY FOR SECURITY HANGERS! After hanging and dressing the booth, we left late Wednesday night and went out to a local Italian restaurant around the corner from our hotel. We thought Thursday was going to be the slow day, since it hadn’t sold out in single tickets until the last few days before the con. We were SO WRONG. It was nuts. In retrospect that makes sense, because lots of people with 4 day passes came to our booth first to stake their claim on the art they wanted. We almost completely sold out of the Batman signed edition, and about half of the limited editions we had brought, which were all highly sought-after #1s in the editions. It took us most of the day to get more organized, and one of my friends who came to help us, who was an organization savant (OS), somehow made the space look great and run like a well oiled machine by the second day. Another friend, who is the ultimate Southern gentleman (SG), was out greeting fans and handing out brochures about Alex’s work. By the second day, everyone knew every piece and could speak fluently about his career and which pieces were best for which collectors. I had to learn the hard way that people from around New York expect to negotiate (I don’t negotiate, generally) so after only a few people tried to get discounts, I steeled myself for some people to walk away in a huff, which only one person did. We had several friends helping us, and gratefully we were staying within walking distance. To anyone who will ever work the NYCC in the future, i’d say this is essential. There were so many people in our booth and so much action, we actually got “Con-brain”, which is a phenomenon I believe could be researched that is the result of a brain too stimulated to continue functioning properly. Normally this only happens from walking around a convention floor with the mass of people in cosplay whilst being assaulted and surrounded by thousands of sounds and sights. I guess if enough people come into your booth, after 5 or 6 hours, “Con-brain” may have to be factored into how you operate. For example, you have to make sure you don’t put your phone or wallet down while shopping for food or ordering dinner somewhere. We mostly just went back to our hotel and hung out together and I made dinner for our crew and we ate together at the hotel. The last thing any of us wanted to do was be around people are walk on our very confused and swollen feet! I brought a bunch of great wine and we had some fun before going to bed early every night. This meant visiting a great little neighborhood store I liked to call “the grocery labyrinth” that was like walking through the maze in The Shining. Right here is where i’ll say the Alex Ross fans are the best. That’s saying something, since I am involved with art from a variety of fandoms. Star Wars, Harry Potter, and as many fandoms as there are movies from the Disney studios, and then some, including character specific fandoms for Mickey Mouse, Scooby-Doo, and Bugs Bunny. It is a bit of apples and oranges, because in the case of Alex Ross, the fans are responding to an artist instead of a property. Having fans get excited about an production artist working in popular culture was like catnip! I overheard a number of people as they brought friends and family to the booth to introduce them to their favorite artist, or the artist that inspired them to draw, or the artist of their favorite comic book. I’ve been told so many times to read Kingdom Come and Crisis on Infinite Earths I actually had to promise to do so! For those of you curious, the people who come to NYCC have much better hygiene. Every day the attendees smelled fresh and delightful. “Jack! I’ll love you forever!” = a guy we met who bought some art with his equally awesome mom went and stood in line for what must have been at least half an hour just to get me a Diet Coke. “I am not Alex Ross.” = Michael, who was processing the purchases, was mistaken for Alex Ross all weekend. They look nothing alike, but Alex so rarely goes to conventions, they just assumed it was him. We think we should get t-shirts made saying “I’m not Alex Ross” printed on them. “Alex is a traditional illustrator in a digital world.” = this was the answer as to why Alex doesn’t do conventions anymore. It’s actually true, in that he still has to make deadlines creating hand-drawn art. For the most part, he can’t click corrections…So he spends most of his waking hours every day painting. Surprisingly, people actually understood! All in all, we did really well and were very pleased with our success. We got back to the Washington area at 4 am, dropped off all the original art at the gallery, and got to bed after having dinner at a time when most people were getting up for work. We still have some original art and limited editions at the gallery, for those of you who want to visit. We pulled some exclusives so that our own longtime clients would have a chance to buy something, and we also were lucky enough to be given a collection of cover art and graphite concepts we are allowed to sell. Huzzah! Stay tuned for what we might do next with both the art of Alex Ross and other artists and art we find exciting. Thanks again for all those who supported us at the con, our new collectors, and especially OS and SG, who came with us and helped. You all did the near impossible, you made working NYCC fun!